Accommodation includes 3 bedrooms, 2 bathrooms and 2 large sun terraces. There is a swimming pool opposite. 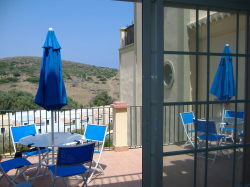 The apartment is an easy drive from Malaga and just off the N340. Near to a beautiful sandy beach and within walking distance of Sabinillas, a quaint Spanish town with plenty of bars and restaurants. A further 10 minute walk will take you to Duqesa Marina from here you can hire boats or go whale/dolphin watching. Scuba diving lessons are also available. There are plenty of golf courses in the area (Casares Golf 2 mins, Duquesa 5 mins, Estepona 10 mins and Valderama 30 mins). 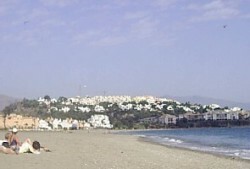 The Casares region and its coastal village Sabinillas, lies about 6km west of Estepona and 10km east of Sotogrande on the CN 340. It is halfway between Marbella and Gibraltar. Puerto Duquesa is 10 mins, Estepona is 15 mins and the famous Selwo Wildlife Park is within is a 10 minute drive.